In this second day of the Sanfermin bullrunnings, the Del Tajo y La Reina bull-ranch made their debut in a fast clean running of the bulls, without any incidents of note. On the first stretch at the slope of Santo Domingo, the bulls stayed together in a tight pack and ran at a very fast pace. On entering the City Hall square, one of the bulls raced ahead, but by the time the bulls reached the corner of Mercaderes all the bulls were once again together in a tight pack. These Del Tajo y de La Reina bulls, despite the fact that it was their first time ever to appear in the Sanfermin Running of the Bulls, let the runners come close to the horns and show some skillful and spectacular running. The whole event took only 2 min. 14sec. and it seems that there was only two injured by trauma, according to the reports of the Complejo Hospitalario of Navarra. At mid-morning the infirmary inside the bullring stated that a third runner received treatment there for two horn jabs to his leg. 1 running bulls. 1 goring. 2 traumatisms. 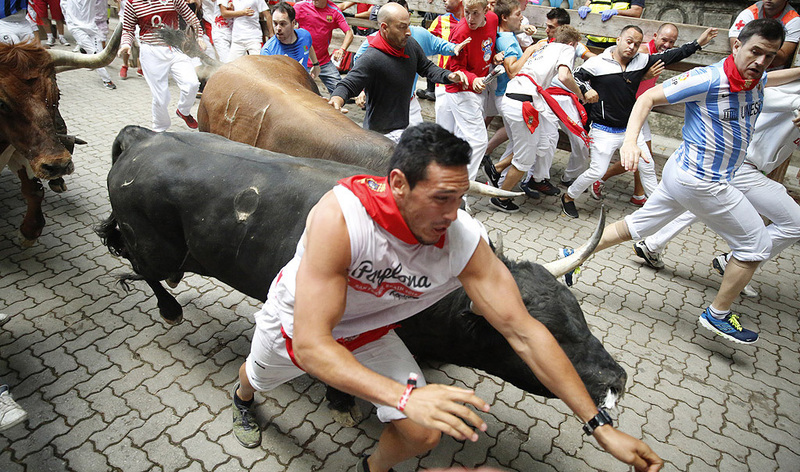 The running of the bulls with the lowest number of wounded from bruises since 07/11/2013. The 6th fastest running of the bulls. The 1st was on 07/13/2011. The 18th time that there are 1 or more gorings in a running of the bulls held on 8th of July. The 4th fastest running of the bulls ever held on Wednesday. The 8th time that a goring took place on Callejon on Wednesday. The previous took place on 07/14/2010.